We are having a civilized discussion here on the trail. Obviously late in the race. Dear Curtis, Missy, Don, Joanne, Frieda, Chino, Jeremy, and all the crew that hosted the tenth annual single speed world championship(NYTimes story, complete with shot of Rowan orangeman , plus Frieda Inglis, Curt’s lovely Texan Granma. Your event was my favorite race since… well, Scotland’s fine ffrolic in September 07. Getting HAULED there by most kind Rotoruan (NZ) Heidi and her man Marcello. Me and pepto-abysmal pink bike ..and a hefty satchel of my wombat merch were borne in style by generous, avid bike pals. 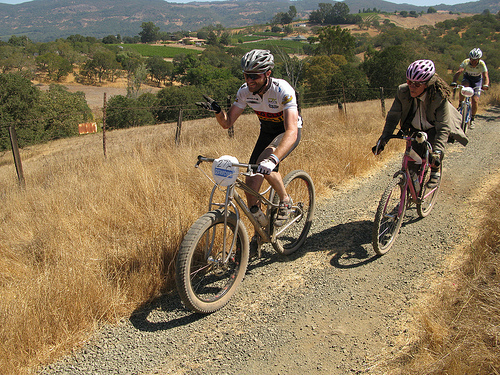 We blabbed excitedly the entire 50 miles, and pulled into the SSWC site: a hayfield in Skyline Park, Napa. Dinner at Azzuro with the Swedes, Bo, Emma, Olle, Anna, Najma, and Linda. Trying to impress them with my seven-word per minute non-rapidfire svenska. Playing banjo away from every camp and getting Gene Oberpriller to appear out of the darkness. The GREAT Gene, last seen in 1996, his last NORBA race as a pro (sez he) in Atlanta Georgia. Ah, a kindred poet-talker spirit! Then JOSH THAYER appears and sits down in the dust with us. Then we mosey over to a camp fire, where I sing As I Roved Out (J. Moynihan version) . Er, then bed down in the dirt, as I have done dozens of times before. Solo under the stars, at peace with the cosmos. Inevitable disturbance which proves some of the Original SSWC Values still obtain: someone bellowing “TOWFER” or maybe “TOPHER!” over and over again near the picnic table I am parked alongside. Someone I will beat tomorrow, of course. Gonna have a bad headache, that one. NOT drinking is the SSWC version of doping….a cowardly, unfair physical advantage which I freely deploy. Hearing spectators compliment me on my natty three-piece suit (must find a picture somewhere), then ask if maybe I’m a bit hot. But best of all was the synesthesia of dusty fragrant chapparal, shadow-striped canyons echoing with ripped spectators (and bailed racers) cheering wmphatically for –or slagging– every single person. I was seriously ready to turn around after beginning the third and final 8 mile loop. Wait…isn’t that Trina Ritchie? I trudged on, a lot cheerier. Half an hour later, there he was, heat stricken, perched on the lip of the switchback before yet another climb. My regular readers know Jon (and friend Chris Marquis) were the original motivator in my re-entry to world competition, er, single speed fun. Jon is extremely swift. Seeing him down is like seeing a racehorse down. Max (Stomparillaz) rolled up and halted (this stopping thing is contagious). We blagged a bit, then I realized I hadn’t ‘time’ to waste–no food on me, and the ride would be a three-and-a-half at this rate. “Me too, or I’ll never move”. Thus did we cross the line together, and a reet fine finish it was. NO BLOOD. No destroyed bike. Just a really hard really fun ride. Can’t wait to read Jon’s story. And see Trina’s and everyone else‘s pictures…including some impressive pro work. ~ by jacquiephelan on August 25, 2008. 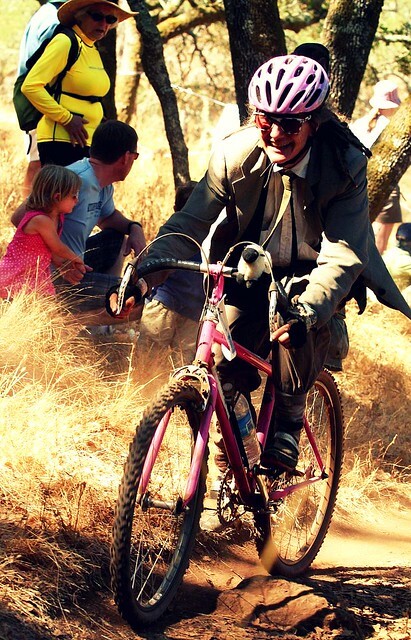 Utter madness riding that course in that heat in that schwanky 3-piece suit… Glad to see things haven’t changed with you. 🙂 I can’t believe I missed out on the SSWC and it was practically in my backyard (about 1 hour away). Sounds like a fantastic time! It was really nice to see you a little bit. More next time. Sit back and watch it unfold. I maintain that a couple of rules might be swiftly enacted: no companies that pay more than 10k taxes/yr, and definitely no automobile companies or their subsidiaries. Is this too much to ask? I hope not. But asking for rules… coming from the Breaker of Rules & Regs? Hey, sometimes I break That rule! The drunk guy yelling Topher was Buck, the sswc 05 winner in state college. And yes you did beat him. He crashed and took himself to the hospital.